Located at Kipolot, Palacapao, Quezon, Bukidnon, one couldn’t ignore this area along the highway when one is traveling Bukidnon-Davao route. Bukidnon, which means “mountain dweller”, is known for its mountain ranges, and this overview park is one of the best spots to see them. This park is an updated version of the old park and is now much developed. It is usually visited by travelers after long-hours of driving because this serves as a rest area. And true enough, the view provides restfulness to a weary soul! One can see this sign/entrance along the highway. You need to walk a few more steps in order to reach a building where comfort rooms are also located. Upon walking further, one will reach descending stairs. Noticeable to one’s eyes are the statues of indigenous people which depict their way of life. Kids posed beside these statues. These statues used to be in bright colors before; but through time, the colors faded away. The highlight of the view here are the mountain ranges and the verdure of the surrounding areas. These are the mountains that you can see around. 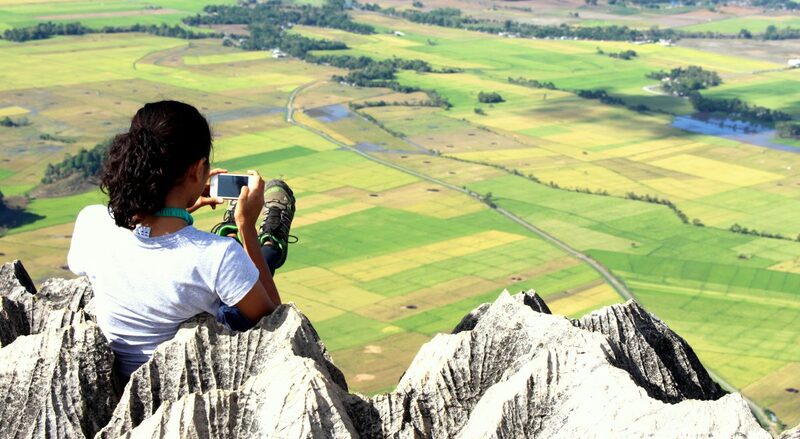 Upon going down further, you can truly see an overlooking view rich in vibrant colors and pleasing to the eyes. One can go down further in order to see the winding road. I felt so much joy upon seeing this view and the tiredness from the travel just simply went away. The lofty mountains reminded me that “Faith can move mountains.” This means that when someone’s beliefs and confidence are strong enough, anything that is difficult is achievable. We are not talking here about self-confidence but God-confidence. And with that, we can truly be able to move and go through with our life’s “mountains”. Someday, all of us will have an overview experience later on in our lives. Just like when you are in the overview park, you will look back on your life and have the whole picture before you. You will see how far you’ve gone, how you’ve grown spiritually and how your life was carefully and beautifully crafted by the Master designer’s hand. At this time we will be able to understand and thank God for the disappointments, failures, growing experiences, withheld hopes and prayers. By that time, our “Why?” now will become “Oh, I see. That’s why.” A beautiful view (life) will be set before us on that day when we allow God to work in our lives. I am looking forward to that overview experience someday. Then will I understand how God orchestrated my life. I am glad I was reminded with this through this trip at Overview Nature and Culture Park. Thanks for sharing madam. So nice makes me think how much more in the new earth awaits. Write more! Stay inspired with God😗. Thanks for reading madam. Indeed! The joy there is unimaginable.. You too! Thanks! That means a lot coming from you. :). Keep Writing! Hello. Im not really good in estimation. 😊. Since traveling to Davao from Musuan, Bukidnon will make you spend 4 hrs. Then from Musuan to Quezon is 1 hour plus. Most likely from Davao to Quezon, you would be spending approximately 3 hours more or less for your travel time. Thats according to my experience but it there are other factors involved like road repairs and whether you travel by public or private transpo. Thanks for dropping by. Hope you get to visit the place. Wouod take 3-4hours fromdavao ecoland terminal . Just arrived here in Valencia Bukidnon for my 3weeks Mindanao job assignment. Hello maam. So far wala po from what I knew. They are constructing something though I dont know if its going to be for accommodation or just a store. Its just an overview park. hi mam, unta mapansin pani nimo. im from cagayan de oro and willing to go there with my girlfriend using a motorcycle. safe ang dalan padulong dinha? bisan og gabi-e? thanks for the feedback mam God bless! Hello. Thanks for dropping by this site. This post was about 2 years ago. And I was able to visit the place last month again. The road is zigzag as it is going up if you are from CDO and going down if you are from Davao. Its generally safe I would say. Just like any other ride, just wear your helmet and drive safely. Hope you’ll have a great time!